The space-themed spiritual successor to Terraria is now available for pre-order in a crowdfunding style of reward tiers. Terraria was a quaint little mining and crafting simulator best described as a 2D pixel version of Minecraft. Its main distinction was that while Minecraft billed itself as a "do whatever you want" sandbox kind of game, Terraria felt almost like a classic RPG, with levels, NPC shops, randomized weapons and boss battles. 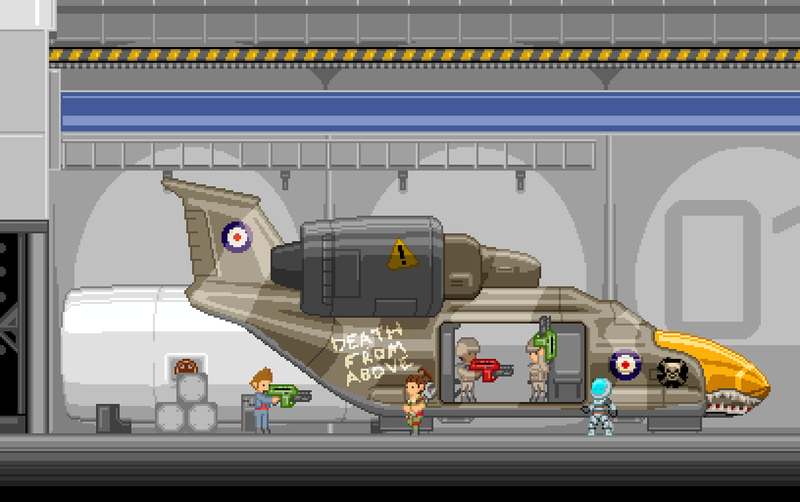 Starbound is the spiritual successor to the game, and is best described as "Terraria but in space." The game is now available for "pre-order" in a crowdfunding style campaign. This means that the game isn't actually finished yet, and your pre-order is directly funding the game's development. Yes, it is essentially a Kickstarter campaign. So what does pre-ordering get you? There are seven tiers of increasing price, each netting you some extra freebies. The basic game is $15, with a 25% discount if you buy a four-pack. All tiers also include a free soundtrack, and beta access to the game, which should launch some time later this year. More expensive tiers allow you to help design custom content for the game, with the most expensive tier, platinum, immortalizing the buyer as a statue in-game. As of writing, developer Chucklefish has raised $157,509 for the game. The FAQ states that the game will be released on Windows, Mac and Linux, with at least the Windows release being handled by Steam. If you are worried about the game being cancelled due to not getting enough pre-orders, the devs have stated that "Starbound is going to make it out in 2013 no matter what. But by pre-ordering you help it get here even faster." Starbound will have a heavy focus on multiplayer co-op. You will start out on a dropship and basically be given free reign to go out and colonize any of the randomly-generated worlds. The devs want players to go out and colonize with the help of their friends, and then team up to fight the creatures that live there. Players will also have a space station "home base," which can be upgraded with cool things like a mech-building factory if they find materials for it out on their colonies. Eariler this month, Terraria developer Redigit teased some screenshots for an upcoming update to Terraria. Update: Starbound pre-orders have hit $500,000 in total pledges, meaning that the first stretch goal has been reached, and a new race, the Novakids, will be implemented into the game. The team have put up a second stretch goal for $750,000: fossils.